The Cleveland Kendo Association provides expert instruction in the Japanese Martial Art of Kendo in the Cleveland, Ohio area since 1986. 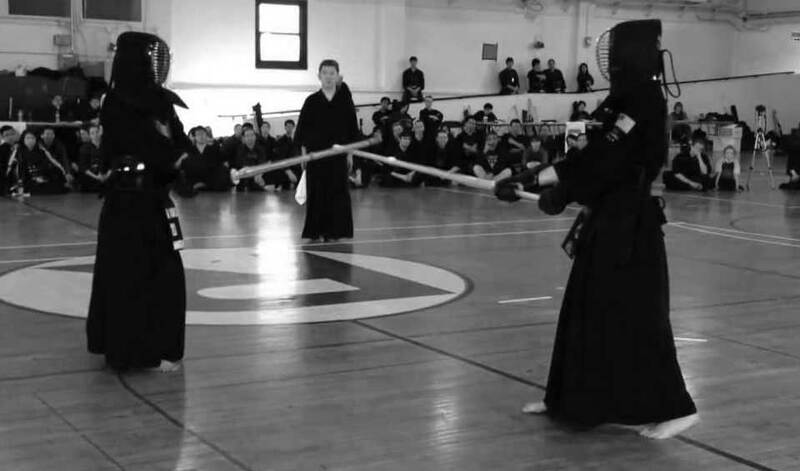 Cleveland Kendo Association is a martial arts school located in Cleveland Heights, Ohio. 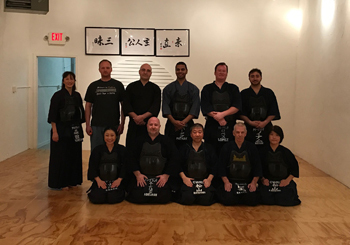 The school was established in 1986 as a not-for-profit organization and has maintained a philosophy of assisting students to obtain Kendo training with minimal financial impact. 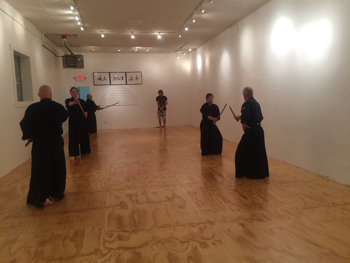 All of our instructors volunteer their time and do not profit from their Kendo activity. This non-commercial and community service philosophy have been instrumental in reaching an array of students from diverse backgrounds to develop a samurai spirituality that can be a powerful source of strength and focus to manage their daily lives. Cleveland Kendo is a proud member of The Greater North Eastern U.S. Kendo Federation - a regional federation of The All United States Kendo Federation, and The International Kendo Federation. Kendo is the Japanese martial art of swordsmanship. Kendo is practiced with a split bamboo sword with leather bindings called a "shinai" and its practitioners wear a modified form of armor that is fashioned after the Oyoroi of the Samurai. Wooden swords called "Bokken" or "Bokuto" are used to practice kata. 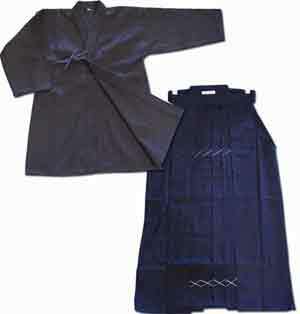 The uniform consists of a traditional woven cotton top called a keikogi and pleated skirt-like trousers called a hakama. Kendo, literally translated, the way of the sword, cannot be traced to a single founder or given an exact founding date. The story of the rise of the modern martial art of Kendo begins with the samurai and extends over the culture of several centuries. By the end of the 12th century, the authority of the Japanese central government had declined. Bands of warriors grouped together for protection forming local aristocracies. Feudalism had come of age, and was to dominate Japan for several centuries. With the establishment of the Shogun in Kamakura and military rule controlling Japan, a new military class and their lifestyle called Bushido, ìthe way of the warrior,î gained prominence. Bushido stressed the virtues of bravery, loyalty, honor, self discipline and stoical acceptance of death. Certainly, the influence of Bushido extended to modern Japanese society and the martial art of Kendo was also to be greatly influenced by this thinking. The Japanese warrior had no contempt for learning or the arts. Although Kenjutsu, "the art of swordsmanship" had been recorded since the 8th century, it gained new prominence and took on religious and cultural aspects as well. Sword making became a revered art. Zen and other sects of Buddhism developed and the samurai often devoted time to fine calligraphy or poetry. The next great advance in the martial arts occurred during the late Muromachi period (1336-1568) often call the "age of Warring Provinces" because of the many internal conflicts. This period brought an increased demand and respect for men trained in the martial arts. Consequently, many schools of Kenjutsu arose, eventually numbering about 200. Each was taught by a famous swordsman whose techniques earned him honor in battle. Real blades or hardwood swords without protective equipment were used in training resulting in many injuries. These schools continued to flourish through the Tokugawa period (1600-1868), with the Ittoryu or ìone sword school,î having the greatest influence on modern Kendo. Kendo began to take its modern appearance during the late 18th century with the introduction of protective equipment: the men, kote and do and the use of the bamboo sword, the shinai. The use of the shinai and protective armor made possible the full delivery of blows without injury. This forced the establishment of new regulations and practice formats which set the foundation of the modern martial art of Kendo. With the Meiji Restoration (1868) and Japanís entry into the modern world, Kendo suffered a great decline. The Samurai class was abolished and the wearing of swords in public outlawed. This decline was only temporary, however, interest in Kendo was revived first in 1887 when uprisings against the government showed the need for the training of police officers. Later the Sino-Japanese War (1894-95) and the Russo-Japanese War (1904-05) again encouraged an awareness of the martial arts spirit. Consequently in 1895, the Butokukai, an organization devoted to the martial arts was established. In 1911, Kendo was officially introduced into the physical education curriculum of middle schools and in 1912, the Nihon Kendo Kata, a set of regulations for Kendo, was published. In 1939 as Japan prepared for war, the martial art of Kendo became a required course for all boys. After the war, because of its nationalistic and militaristic associations, Kendo was outlawed and the Butokukai was disbanded. However by 1952, supporters of Kendo successfully reintroduced a ìpure sportî form of Kendo, called Shinai Kyogi which excluded the militaristic attitudes and some of the rougher aspects of practice characteristic of prewar Kendo, into the public schools. 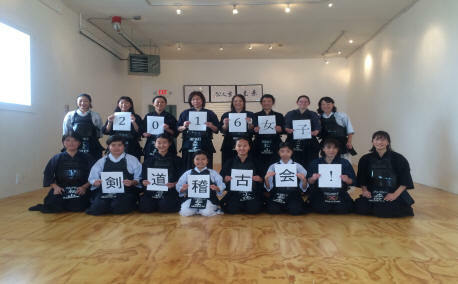 Today, Kendo continues to grow under the auspices of the All Japan Kendo Federation, the International Kendo Federation, and federations all over the world. Although the outward appearance and some of the ideals have changed with the changing needs of the people, the martial art of Kendo continues to build character, self-discipline and respect. Despite a sportlike atmosphere, Kendo remains steeped in tradition which must never be forgotten. For here lies the strength of Kendo which has carried it throughout history and will carry it far into the future. Aikido is a modern Japanese martial art, founded by Morihei Uyeshiba Sensei in the last twentieth century. Aikido is rooted in the Japanese martial art of Jujitsu, which emphasizes grappling, joint locks (immobilization) and projections (throws). Unlike Jujitsu though, Aikido places focus on non violent resolution of conflict and not on the destruction of the opponent. Instruction in Aikido is provided by Betsy O’Donnell Sensei 4th Dan Aikido of Lake Shore Aikido. O’Donnell Sensei is affiliated with, and accredited by The Aikido Schools of Ueshiba (ASU) which is the membership organization that affiliates more than 100 North American Dojos under the instruction of Mitsugi Saotome Shihan. It is a formally recognized organization under the Aikido World Headquarters in Tokyo, Japan. Established in 1975, the ASU is a 501(c)(3) nonprofit organization managed by a board of senior instructors. To learn more about O’Donnell Sensei and Lake Shore Aikido please visit their website at www.lakeshoreaikidocleveland.com . The concept of Kendo is to discipline the human character through the application of the principles of the Katana (sword). 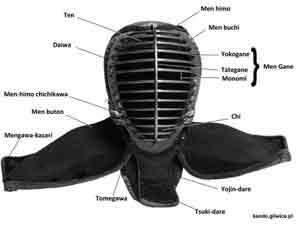 The Concept of Kendo was established by All Japan Kendo Federation in 1975. The new dojo is built! Our new dojo is located at 2110 South Taylor Rd Cleveland Heights, Ohio 44118. What is a Dojo Sho? In Japanese culture, a school (dojo or juku) logo is called a "Dojo Sho（道場章)". A Dojo Sho is an important symbolic reflection of the values of the school. The Dragonfly is said to only fly straight ahead. Unable to fly backwards, it thus became a symbol of the spirit to “never give up” and “never retreat”. Additionally, the Dragonfly’s wings resemble the blades of a sword (Katana). During the Sengoku era, this quality was especially admired by warriors, and it received the name of “Kachi-mushi” （勝虫）as a symbol of sure victory. 勝虫 can be also pronounced as Katsu-Chu. Coincidentally, “Katsu-Chu” is the same pronunciation as the word for armor (甲冑). These characteristics made the Dragonfly a symbol that was used by the samurai for centuries. The image of the Dragonfly has been used in the design of clothes, decoration of armor and related items to bring success to the owner of these items. The Dojo Sho of Akitsu symbolizes our deep connection to traditional Japanese martial arts values (Budo), and the Samurai concept of moving straight forward courageously, without retreat, and never giving up. The shape of our Dojo Sho is round, like the tsuba (hand guard) of the sword carried by the Samurai (Katana). In Japanese culture the sword is a powerful symbol that represents, among other things, a person’s soul and inner strength. Just as the sword passes through the hole in the center of the tsuba, we also pass through our own personal challenges and elevate ourselves through the practice of Kendo (the way of the sword). The Cleveland Kendo Association operates under the guidance of Dr. Tsuyoshi Inoshita MD (Kyoshi 7th Dan Kendo), President of the GNEUSKF. Head Instructors: Dr. Shigemi Matsuyama PhD (5th Dan Kendo 2dan Iaido), Mieko Matsuyama (4th Dan Kendo). 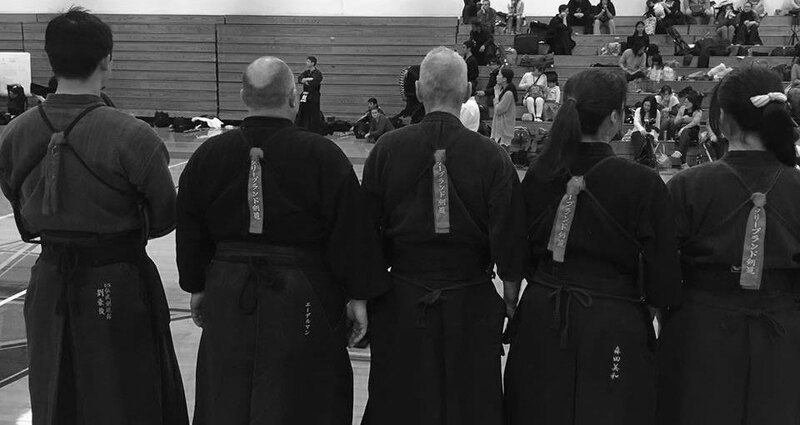 Instructors: John Beaty (4th Dan Kendo), Neil Adelman (4th Dan Kendo), and Dr. Miwa Morita PhD (3rd Dan kendo). Note: All of our instructors are accredited by the All United States Kendo Federation (AUSKF). "Kendo begins and ends with Rei". The word ‘REI’ in Japanese refers to the physical act of bowing as well as ‘good manners’ in general. Good etiquette in kendo is essential. It is the manifestation of respect, consideration, and gratitude for your partner, your instructors, and yourself. This is the essence of "REI". In Kendo, like many other martial arts, etiquette is an important aspect that needs to be constantly practiced and continually observed. To be clear on terminology, "Reigi" is the concept of etiquette and "Reiho" is its physical manifestation. Etiquette in the dojo is not designed to give airs and graces to senior members. Nor it is designed to contribute to the mystique of the martial arts. Etiquette is common sense, discipline and manners on the whole, and is an integral requirement for self-awareness and development. 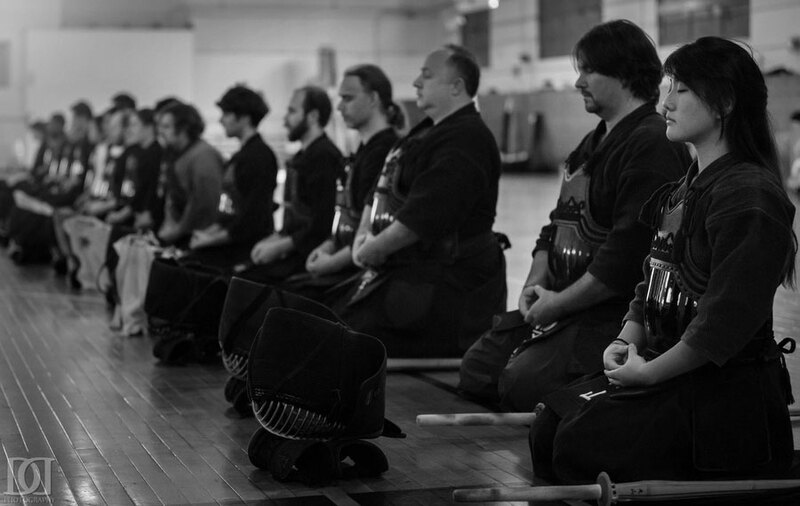 It is the means of conveying respect towards the dojo, sensei, sempai, peers, and towards the art of Kendo itself. It is perhaps the easiest facet of Kendo to transfer from the dojo to everyday life as concepts of respect, courtesy, and restraint become embedded in everyday actions and considerations. Almost all of kendo has been regulated and systematized, which make it almost impossible to list and memorize all the possible points; this is at best an incomplete list. We are all learning and all make the occasional mistake but if you find yourself in an awkward position, correct yourself as quickly and quietly as possible, apologize ("gomenesai"), and return your attention to practice. Much of it is really just common sense and good manners in the dojo. Greet your instructors and seniors upon entering the dojo. The "Men" should not be taken off until the command is given at the conclusion of practice. Step over a shinai, bokuto (wooden sword), or Iaito, lean on it, twirl it, or drag it. Treat it with disrespect. It is to be considered as a real sword and is to be afforded the necessary level of respect. Walk in front of other kendoists who are seated or standing. If necessary, extend your right hand and bow slightly as you pass. Soji (sōji) is a Japanese ritual/art for cleaning the dojo after practice. It derives from Zen where purification and several practices around it are closely connected to cleanliness and purity. 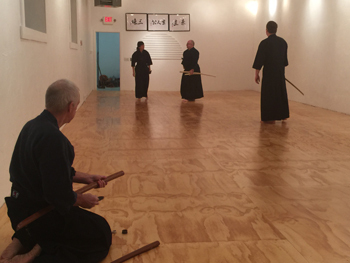 At Akitsu Kendo Dojo (Cleveland Kendo), we sweep the floors with traditional brooms, clean the floors with hand cloths, and wipe down any areas that collect dust, including the guest area. All instructors, students, and visitors participate. The purpose of Sōji is not only to clean the dojo and polish the floor, but to polish ourselves. Soji is a fundamental part of our Kendo practice that demonstrates appreciation, care, pride and respect for each other and the dojo we have the privilege of using. Kata were originally used to preserve the techniques and history of kenjutsu for future generations. In the past, many ryu or schools of Kendo had their own set of Kata that students used to learn. Nihon Kendo Kata were first unified in the Keishicho Gekken Kata or Police Department Attacking Motion Kendo Kata, when exemplary kenshi were hired to standardize kata instruction in 1880. Nihon Kendo Kata were finalized in 1912 by integrating many kata (forms) from different kenjutsu schools. Modern usage of kata is as a teaching tool to learn strike techniques, attack intervals, body movement, sincerity and kigurai (pride). Kendo kata are practiced with a solid wooden sword called a bokken. More formal demonstrations are conducted with Katana, usually of a form that is similiar to that used in Iaido, but heavier since contact is made with another sword. There are ten kendo kata specified by the All Japan Kendo Federation, 7 kata with tachi (long sword) and 3 kata with kodachi (short sword). Each kata studies a single set of concepts in a very pure setting allowing the practitioner to delve deeply into these concepts. 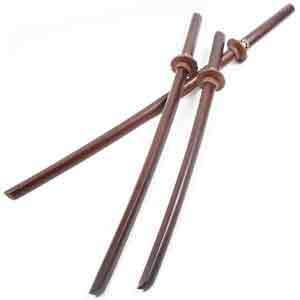 Kendo kata are practiced between two people, the Uchitachi and the Shidachi. In kendo kata, the Uchitachi attacks the Shidachi who in turn demonstrates a proper response to the attack. Seven of these kata are illustrations of the technique of the long sword against the long sword. The last three kata illustrate the short sword defending against attacks by the long sword. Prior to the invention of the shinai and bogu, kata were the only way that kendoists could safely practice. Originally, the role of Uchitachi was taken by the teacher and the role of Shidachi by the student. This tradition carries over into modern Kendo kata in that the Uchitachi always sets the pace and distance at which the actions are performed. Bokuto Ni Yoru Kendo Kihon-waza Keiko-ho (Bokuto Application for Kendo Fundamental Technique Practice) is a new form of bokken training that is directly translatable to bogu Kendo. The fundamental concept of Kendo is to cut with a sword: the Shinai representing the sword. However, this concept has become obscured as Kendo has become more sports oriented. The Kendo Kata was established in 1912 to teach to and preserve the concept that the shinai and the katana are one in the same; however, the Kendo Kata, in addition to being difficult for most beginners, is infrequently practiced and is often exercised only in hurried preparation for examinations. Therefore, the Bokuto Ni Yoru Kendo Kihon-waza Keiko-ho was developed to bridge the gap between modern kendo practice and traditional training concepts and values . Bokuto Ni Yoru Kendo Kihon-waza Keiko-ho also facilitates learning the Nihon Kendo Kata, and because of this was adopted by the All Japan Kendo Federation for use in primary and secondary school. While Nihon Kendo Kata uses all five kamae, Bokuto Ni Yoru Kendo Kihon-waza Keiko-ho uses only Chūdan-no-kamae, the most common stance. Instead of student and teacher roles, there are the equal roles of Motodachi and Kakarite. The Motodachi receives the waza of the Kakarite. The first four waza are focused on attack initiaion techniques, while the final five are focused on techniques for responding to an attack . Uchida, Mark (2003). "Bokuto Ni Yoru Kendo Kihon-waza Keiko-ho (Bokuto Application for Kendo Fundamental Technique Practice)". Mushinkan Dojo. 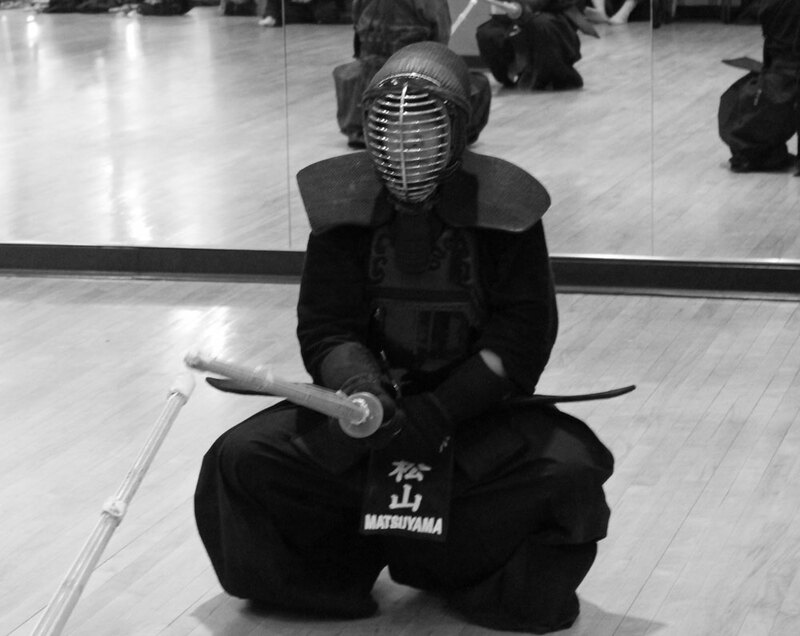 Kendo equipment consists of the swords, uniform and armor. There are two types of wooden swords used. 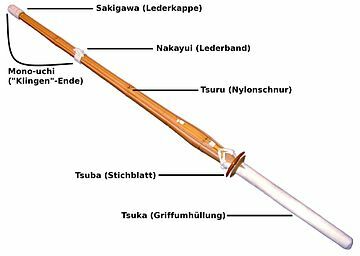 First, the bokken or bokuto, a solid wood sword made of oak or another suitable hardwood. The bokken is used for basics and forms practice (kata). Second, the shinai, is made up of four bamboo staves and leather. The shinai is used for full contact sparring practice. 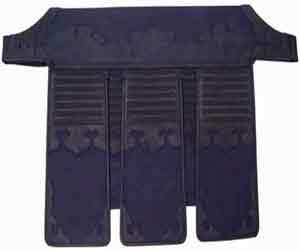 The uniform or dogi consists of woven cotton top called a keikogi and pleated skirt-like trousers called a hakama. 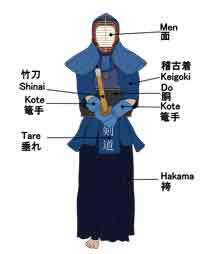 The armor or bogu consists of four pieces: the helmet (men), the body protector (do), the gloves (kote), and the hip and groin protector (tare). 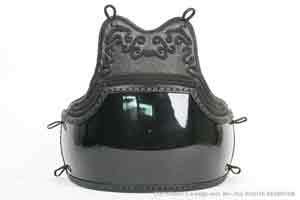 Modern Kendo armor design is fashioned after the Oyoroi of the Samurai. Mokuso is part of the training of the mind called “Mushin”, which comes from Zen Buddhism. One must attempt to return to the mental state of a new-born-child that is without a sense of fear, not conscious of distress, pain, cold etc. A baby cannot anticipate these things and therefore has no fear and does not hesitate before moving. An adult knows fear and is afraid. When attacked they feel tense and are often useless against the assailant because movement is restricted. If one sees a beautiful flower, normally the mind concentrates on it, but with an empty mind (Mokuso) the mind is aware of everything else as well as the flower. So when one fights an enemy, attacking and defending, if only concentrating on blocking techniques, the mind is restricted to that movement, but if the mind is empty the body is able to do the next movement automatically and movements will always be natural. If the body is tense it is wasting energy and restricting speed, it is essential to move without being conscious of it. That feeling is called Mushin. The word Mokuso is formed by several ideograms that all together, are translated as “watching in silence toward our heart. To think or to reflect profoundly”. Meditation is to the soul and the spirit, what the physical workout is to the body and mind. “As a crystalline water's lake reflects without distortion all that exists around it, giving to it a shade of tranquility and perfection to the nature; thus it must be the mind of the kendo student toward the teachings of the master”. Mokuso is one of the paths leading to this state of mind. The development of a strong commitment toward attaining peace and serenity puts us in harmony with the universe. The meditation is the vehicle to this union with the world and its inhabitants. Releasing the mind of any thought, we can see another dimension of the world. In this state of complete relaxation and sublime concentration, we release any mental disturbance (hatred, fears, pains, excessive desires, etc.) and simultaneously we unconsciously generate a psychic force. It is virtually impossible to create this force consciously. Just as we train hard to perfect techniques until they become part of our “body memory”, the practice of meditation teaches us to release this psychic force in a conditioned reflex for spiritual growth. While we advance toward this goal, the practice of meditation has beneficial effects. Daily meditation reduces stress, oxygen consumption decreases, which (cellular oxidation). The blood pressure and the pulse tend to slow. The lower respiratory rate stabilizes the nervous system. Meditation is defined by some experts as the perfect passive activity for the health of human beings. To practice standing, sitting or lying down, we should meditate in complete stillness. Keep in mind that the practice of kata is by and large, an active form of very advanced meditation, and only those which have devoted many years to the practice of passive meditation, along with kendo training, can discover this active meditation. To reach this level one must learn and practice certain specific relaxation techniques. These techniques must be executed with an iron will. 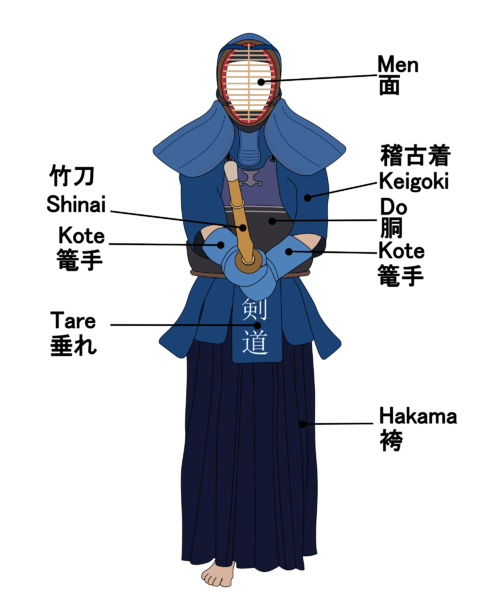 In Kendo, Mokuso is a very important ceremony and should be practiced immediately before "Men Tsuke" (putting on the Men, or head gear) to garner the proper resolve for a hard practice session, as well as after each Kendo practice. Additionally, practice Mokuso for at least sixty minutes daily, preferably at sunrise and before bed. Little by little, as a result of perseverance, Kendoka can learn to live in a constant moving meditation. The Cleveland Kendo Association and Lake Shore Aikido are "non-commercial" groups and do not profit from our activities. We only seek to cover our minimum expenses and keep our practices affordable and accessible. Our instructors are all volunteers. Unlimited Training! For one monthly membership fee you can choose to learn Kendo or Aikido, or both, and participate in as many practices as you want during any week or month (note: new members may be restricted to beginner's classes until they reach a sufficient level to join in more advanced group practices as decided by the instructors). Free Trial: Your first lesson in Kendo and/or Aikido is free. Note: No serious student will be turned away due to financial hardship. Sliding scale is available at the discretion of the head instructor. Both Cleveland Kendo and Lake Shore Aikido are part of a wider community of national and international organizations who provide instruction, guidance, accreditation, and promotion exams to our instructors and students. All students are required to become members of these organizations depending on which martial art you practice. Kendo students: Membership in the Greater Northeastern U.S. Kendo Federation and the	All United States Kendo Federation. Collected once per year in January or February. 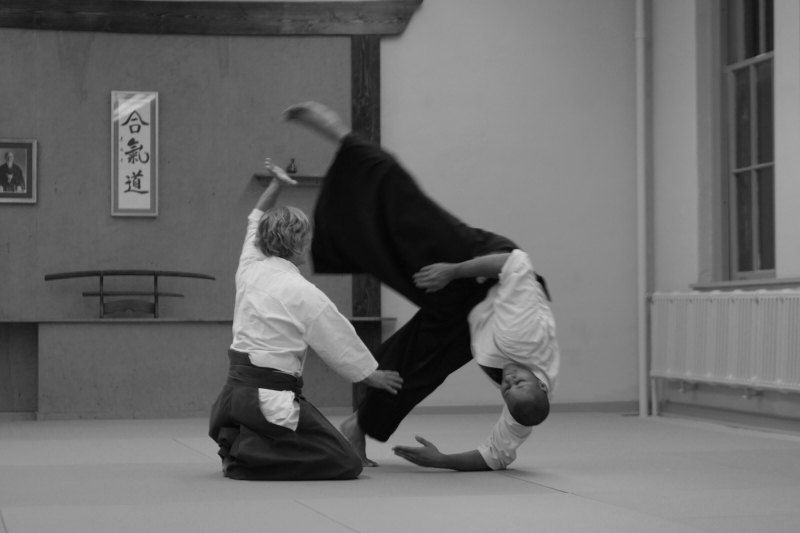 Aikido students: Membership in the Aikido Schools of Ueshibo. Collected once per year in January. <> Payment made directly to the Aikido Instructor. Visitors are always welcome to watch our practice. We are happy to answer any of your questions before and after the scheduled practice. We only ask that you e-mail us at contact@clevelandkendo.com to let us know you are coming. Do Have Additional Questions? How Can We Help? 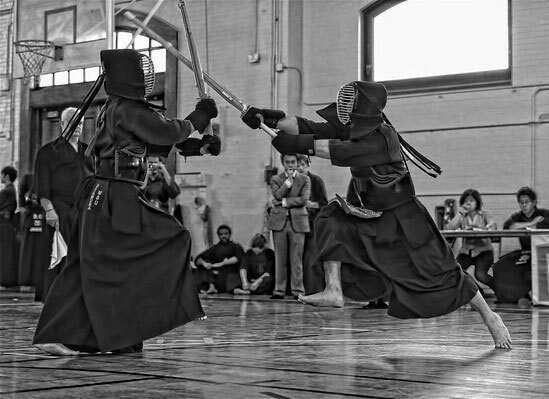 Since 1988, The Annual Cleveland Kendo Tournament has become one of the longest running continuous Kendo tournaments in North America, attracting competitors from across the United States, Canada, Japan, and other countries. SEE DETAILS BELOW. We are happy to invite you to the 31st Cleveland Kendo Tournament / Greater Northeastern United States Kendo Championships at Adelbert Gymnasium at Case Western Reserve University in Cleveland, OH on March 29 – 31, 2019. 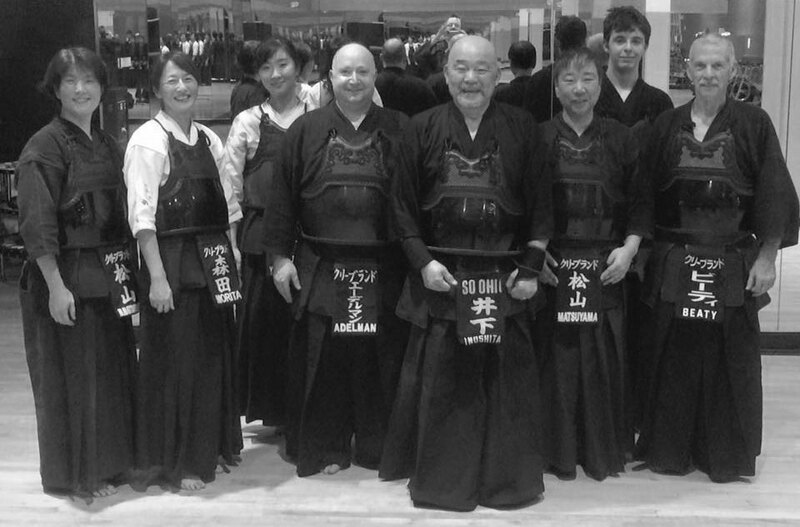 We are proud to announce that Takeshi Ishii Sensei, 8dan kyoshi, former vice chief instructor of Tokyo Metropolitan Police Kendo, will be with us during the tournament weekend. He will give us a special kendo seminar as part of the GNEUSKF Kendo Educational Tour 9 AM to 12:00 noon on Sunday March 31, 2019. Attached please find information on the31st Annual Cleveland Kendo Tournament. We are processing applications the same way as last year. Thank you for your cooperation, and we are looking forward to seeing you in Cleveland this spring. Since 2010, the Case Western Reserve Kendo Club has been hosting a kendo tournament in September for middle school, high school, and college students (and recent graduates). The weekend encompasses special practices and seminars with visiting instructors, an AUSKF sanctioned promotion examination, and of course the competition itself. On behalf of the Case Western Reserve University Kendo Club, I would like to cordially invite all of you to our 9th Annual Student Cup. This event will be held on the 5th to 7th of October 5th to 7th, 2018. We welcome all high school, university, and recent alumni to participate in our event. Furthermore, I am happy to announce that this event will also include a shinpan seminar, a promotional exam up to the 3rd dan, and many opportunities for godo geiko. The seminars, co-sponsored by GNEUSKF, are open to everybody, not just student kenshi, so please do not hesitate to join us! Follow the links below for our tournament and promotion exam registration and information. Please take care to read the information, and send us your forms postmarked by the 17th of September 2018. Tournament Information, Tournament Registration, Promotion Exam Registration, Promotition Exam Questions.